South-Central Utah's 900+ mile Paiute ATV Trail System, a trail system with no beginning and no end, making it the largest in the nation! It passes through multiple towns and has side trails leading to others. Dirt Wheels magazine rated the Paiute ATV Trail as one of the top 10 trail systems in the country. It has been rated as one of the top 5 trails in the country by ATV Illustrated magazine. Many riders consider the Paiute Trial to be the TOP US trail system. 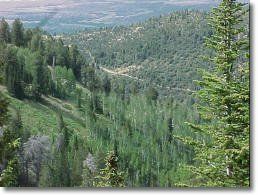 The Paiute ATV Trail system is designed to provide an enjoyable recreation ride through fantastic scenery. The trail system was formed by connecting old roads and trails crossing the Fishlake National Forest with intervening BLM-administered land. Multiple narrow sections of trail were constructed to complete the interconnecting #01 loop. The main #01 trail is 238 miles long, with over 800 miles of marked side trails and an estimated 1900+ miles of additional side forest roads and trails that are open to ATVs and other recreational vehicles thus making the Paiute ATV Trail System the largest in the country. The Paiute ATV Trail caters to relaxing and family-type riding. Riders along the trails enjoy the scenery and atmosphere of a deeply dense forest, as well as popular activities such as fishing or camping near the path. It is truly impossible to put in writing how people must feel as they sit on a ridge at 11,000 feet looking a hundred miles into the distance, or maneuver their machine through a dense forest on a four-foot-wide trail. The surge of joy and wonder when people see a free-roaming herd of deer or elk is hard to describe. While taking a break on a beautiful canyon trail, one would have to think, "It would be impossible to describe this place - you have to be here!" Just the main loop of the #01 trail is estimated to take approximately 25 riding hours to complete - but that doesn't leave much time for stopping or taking pictures. For comfort and full enjoyment of the trail, the time should be spread out over three to four days. However, riders choosing to explore the thousands of miles of marked and unmarked side forest roads and trails may find themselves riding for weeks. Every year in April, May, & June, when temperatures begin to rise, people start thinking seriously about the fun of getting out on the trail. They remember the grand times they had on the Paiute, or they dream wistfully about what they have heard or read about the trail. Spring through fall offers riding opportunities, though each season brings its own experiences and adventures. While spring riding is possible on the lower portions of the trail, snowdrifts usually close the trail over the Pahvants and the Sevier Plateau until early July. This part of the trail traditionally remains closed until mid-to-late July. 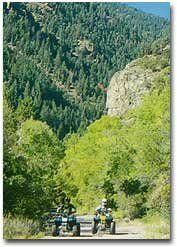 September and October provide some of the best riding weather on the Paiute Trail. At this time of year the days are brisk, the nights cool, the trees colorful, and the chance of precipitation is low. August is also a good time for the high country, although the lower portions of the trail can be hot. After October storms may close the upper portions of the trail or make riding slightly unpleasant, but not unbearable. 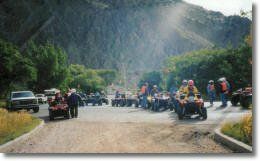 Located in South-Central Utah, the Paiute ATV Trail surrounds the towns of Salina, Richfield, Aurora, Elsinore, Monroe, Joseph, Koosharem, Marysvale, Junction, Circleville, Beaver, and many others, making any of these a great place on the trail to set up camp, and explore in every direction. ATV's are allowed on designated city streets allowing easy access to the trail. With plenty of Camping, Hotels, Restaurants, Services, and ATV rentals available. You will find these communities to be the perfect place to stay while you enjoy the many miles of trail. From almost any of these towns you can make nearly every point on the trail within a days ride. Within minutes of downtown you will be enjoying the most spectacular scenery the trail has to offer. As we said, just the the main #01 trail is over 238 miles long, with thousands of miles of marked side trails and other side forest roads and trails, so we suggest that you do it in segments. The Paiute ATV Trail is home to two of the countries best ATV Jamboree's. 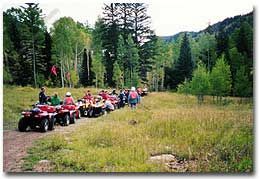 The Fillmore National ATV Jamboree, held each June with 14 choices of trail rides for 500 rider, and the Rocky Mountain ATV Jamboree, held each September with over 70 guided trail rides and 650 riders. Each features an ATV EXPO, mud bogs, ATV pulling contests, ATV Rodeo's and much more. The Paiute ATV Trail is also home to one of the best UTV Jamboree in the nation. The Paiute UTV Jamboree, held each August in Marysvale Utah, is a MUST DO event. So get out and enjoy the Jamborees. 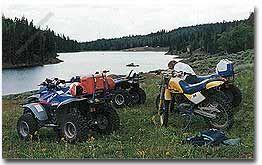 Special thanks to the Fishlake, Manti LaSal & Dixie National Forests and the Richfield District of the Bureau of Land Management, the Paiute ATV Trail Committee consisting of private individuals, and representatives of City, County, State, and Federal organizations which guide trail development and use. Their land use and management policies have allowed for our controlled and careful use of ATV’s on public lands. Thanks also to the Utah Division of Parks and Recreation, which administers ATV registration, safety , rider training & certification programs in Utah.